Caiman free games: Cubemaster Gold by Peter and Sven Nordström. 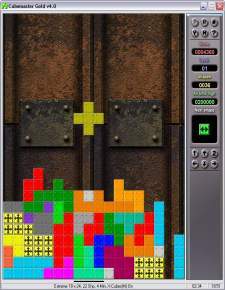 Cubemaster is an action / puzzle game that have some similarities with and old game called Tetris, however Cubemaster is much more advanced. Instead of being confined in a 10 * 20 big dropzone with 7 shapes cubemaster is flexible beyond belief. It contains 32 shapes where some are built up with as much as 8 cubes. The goal is to place the shapes in such manor that they build solid rows, when a row become solid it is removed and the blocks above fall down with a bang. If you are successful with this you will stay away from the top and get a great highscore, if you however should reach the top then the game is over.